This document is a technical summary of the unpublished Federal Highway Administration (FHWA) report, Development of a Family of Ultra-High Performance Concrete Pi-Girders, available through the National Technical Information Service, www.ntis.gov. Ultra-high performance concrete (UHPC) is an advanced cementitious composite material, which tends to exhibit superior properties such as exceptional durability, increased strength, and long-term stability. (See references 1–4.) The use of existing structural configurations for materials with advanced properties results in inefficient designs and less cost-effective solutions. Therefore, the purpose of this research is to develop a series of optimized sections of UHPC pi-girders to effectively utilize the superior mechanical properties of UHPC over longer span lengths through finite element analysis (FEA). The Federal Highway Administration (FHWA) at the Turner-Fairbank Highway Research Center (TFHRC) has executed a research program developing a series of structurally optimized bridge girders that engage the superior mechanical properties of UHPC. Four new, simple span cross-sections were developed based on the pi-girder concept. The research was performed using a calibrated finite element model. The cross-sectional parameters that were varied include girder depth, the bulb width and height, the web thickness, and the strand layout in the bulb. The analysis evaluated the local transverse bending capacity of the deck, the global flexural and shear capacity of the girder, and the live load deflection of the three-girder system. The results indicated that the new cross-sections have enough capacity to accommodate span lengths up to 135 ft (41.1 m). A design chart was developed to facilitate preliminary bridge design. FEA was used to perform parameter analysis and optimize the cross-section because of its advantages of being efficient and inexpensive. However, the model used in FEA has to be verified against experimental results before it can be expanded for parametric study. Structural tests on a second-generation pi-girder were conducted in the laboratory. A finite element (FE) model based on a concrete damage plasticity model was built and calibrated based on the experimental results. (5,6) The results indicated that the FE model can effectively capture the behavior of the tested pi-girders with reasonable accuracy. This makes it possible to conduct parameter analysis and section optimization using the calibrated FE model. Table 1. Maximum load ratio and equivalent wheel pressure when the strength limit state is reached. To facilitate preliminary bridge design, it is desirable to develop different cross-sections for different span lengths. Across the family of new cross-sections, the slope of certain surfaces and fillet radii were unchanged in order to facilitate the common use of formwork. The increment for girder height was chosen to be 4 inches (102 mm), and the increment in the bulb size (height and width) was 2 inches (51 mm). A single girder model was used to investigate the relationship between cross-section parameters and the span length. The wheel load was applied above the web to suppress artifacts from transverse bending failure. The magnitude of the load corresponds to the standard AASHTO LRFD Strength I wheel load. In the investigation of flexure capacity, the design truck was simulated by applying the entire load of the design truck on the wheel patch at midspan, which is unrealistic but conservative. In the analysis of global shear behavior, the load was applied at a distance of three times the girder depth away from the support point. Through an iterative process, the four cross-sections shown in figure 1 through figure 4 were developed for different spans. More detailed results are summarized in table 2. In the table, the strand layout was named by the number of strands in each row starting from the bottom. Figure 1. Illustration. Strand layout of 35-inch (889-mm)-deep section for 80-ft (24.4-m)-span. Figure 2. Illustration. 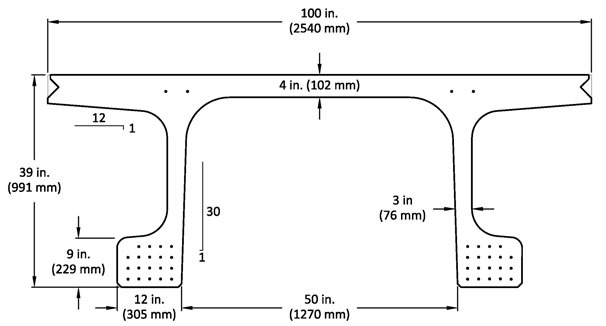 Strand layout of 39-inch (991-mm)-deep section for 95-ft (29-m)-span. Figure 3. Illustration. 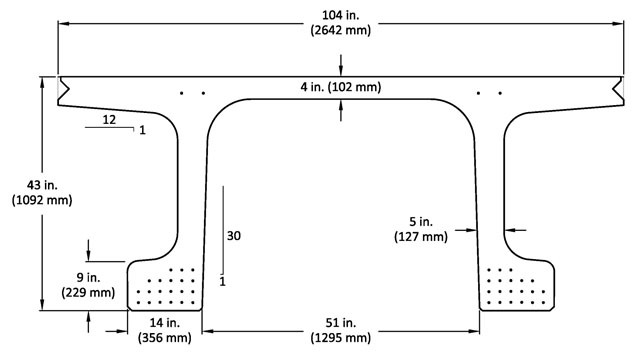 Strand layout of 43-inch (1,092.2-mm)-deep section for 105-ft (32.0-m)-span. Figure 4. Illustration. 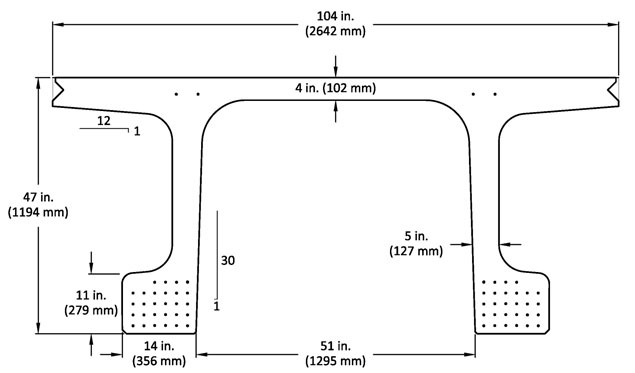 Strand layout of 47-inch (1,193.8-mm)-deep section for 135-ft (41.1-m)-span. In practice, a bridge span may be shorter than the maximum allowable span for a particular cross-section. To facilitate the use of these research results, shorter spans were also investigated for each cross-section. To achieve this, a parametric analysis was conducted to find the maximum span for cross-sections with the same depth but different strand layouts. The shear capacity was not checked in this portion of the analysis, as the shear load was basically unchanged. 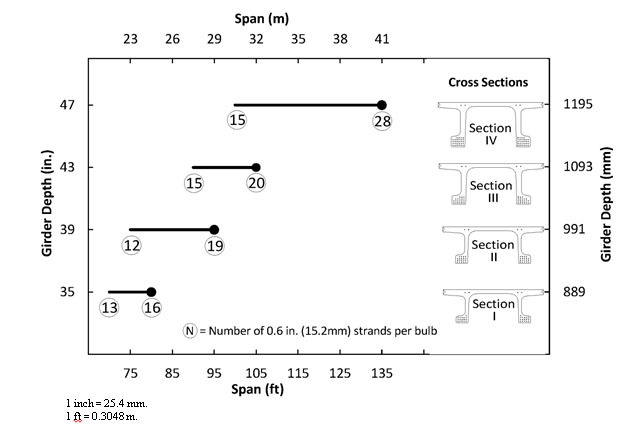 The results of using cross-sections with fewer strands on shorter spans are summarized in table 3. Combining results from previous sections, figure 5 shows a graphic representation of the applicable span range for each girder depth. Table 4 summarizes the properties and applicable span range for each proposed cross-section. Table 2. Proposed cross-sections for different span length. Table 3. Modified cross-sections for application on smaller span length. Figure 5. Illustration. Summary of developed cross-sections. Table 4. Section properties and applicable span range for proposed sections. In addition to the strength-limit state, AASHTO LRFD also contains language regarding the flexibility of the structure under live load. It recommends that deflection divided by span not exceed 0.125. The deflection should be taken as the larger of the deflection due to design truck alone or due to 25-percent of the design truck together with the design lane load. Since deflection is primarily driven by span length, the deflection check was conducted only for the maximum span for each cross-section. In this section, a three-girder bridge model was used. The deck widths of the developed cross-sections are 100 inches (2.54 m) or 104 inches (2.64 m). A three-girder system is enough to accommodate two traffic lanes. This configuration is considered to be conservative compared to other combinations of girder numbers and lane numbers. The lane load and wheel load were biased toward the exterior girder on one side of the bridge. This load pattern creates maximum possible deflection. Trial simulation indicates that the deflection due to truck load is always greater than the deflection due to 25 percent truck load plus design lane load. Therefore, only the deflection under truck load was checked in this section. The results are tabulated in table 4, which shows that all the cross-sections meet the deflection requirements. Table 5. Deflection under truck loads for refined cross-sections. This study conducted a parametric analysis to develop optimized cross-sections using a finite element model calibrated from experimental results. The parameters that were considered in the optimization include deck thickness, girder height, web thickness, bulb size, and strand layouts. The proposed sections were designed to resist loads in excess of those required by the AASHTO LRFD Bridge Design Specifications while meeting the live load deflection recommendations. Even though the deck thickness analysis demonstrated that a 3.5-inch (89-mm) deck is sufficient in terms of strength, a deck thickness of 4 inches (102 mm) is recommended, considering construction tolerances and other uncertainties. A family of UHPC pi-girders was developed for spans ranging up to 135 ft (41.1 m) and loaded under simply supported boundary conditions. Girders with depths of 47 inches (1,194 mm) can be used on spans of 135 ft (41.1 m) or less. Those with 43 inches (1,092 mm), 39 inches (991 mm), and 35 inches (889 mm) can be applied for spans up to 105 ft (32.0 m), 95 ft (29.0 m), and 80 ft (24.4 m), respectively. Graybeal, B., Ultra-High Performance Concrete, Report No. FHWA-HRT-11-038, Federal Highway Administration, U.S. Department of Transportation, McLean, VA, March 2011. Graybeal, B., Material Property Characterization of Ultra-High Performance Concrete, Report No. FHWA-HRT-06-103, Federal Highway Administration, U.S. Department of Transportation, McLean, VA, August 2006. Graybeal, B., Structural Behavior of Ultra-High Performance Concrete Prestressed I-Girders, Report No. FHWA-HRT-06-115, Federal Highway Administration, U.S. Department of Transportation, McLean, VA, August 2006. Graybeal, B., Structural Behavior of a 2nd Generation UHPC Pi-Girder, Report No. FHWA-HRT-09-069, Federal Highway Administration, U.S. Department of Transportation, McLean, VA, 2009. Chen, L., and Graybeal, B., “Modeling Structural Performance of Ultra-High Performance Concrete I-Girders,” ASCE Journal of Bridge Engineering, 17, No. 5, September–October 2012, pp. 754–764. Chen, L., and Graybeal, B., “Modeling Structural Performance of 2nd Generation Ultra-High Performance Concrete Pi-Girders,” ASCE Journal of Bridge Engineering, 17, No. 4, July–August 2012, pp. 634–643. AASHTO, “AASHTO LRFD Bridge Design Specifications, Customary U.S. Units,” American Association of State Highway and Transportation Officials–6th Edition, 2012. Researchers—This study was led by Ben Graybeal at FHWA’s Turner-Fairbank Highway Research Center. It was conducted by Gang Zhang of PSI, Inc. through laboratory support contract DTFH61 10 D 00017. For additional information, contact Ben Graybeal at (202) 493-3122 or in the FHWA Office of Infrastructure Research and Development located at 6300 Georgetown Pike, McLean, VA 22101-2296. Key Words—Ultra-high performance concrete, UHPC, finite element analysis, pi-girder, structural optimization.